"...All things are as they were then, except for one thing: when CBS is there, You Are There! You Are There is based on authentic historical fact and quotations. And now, on to our story....."
So begin the incredibly well done Old Time Radio programs "You Are There!" originally broadcast between 1947 and 1950. And you really do feel like You Are There, the announcers report "live" from the scene of the action. Imagine, you and your children speaking authoritatively on what public opinion was regarding the Impeachment of Andrew Johnson. Or why the English thought it best to turn Joan of Arc over to the French, even though she was fighting successfully against England! Or whether Captain Kidd was a pirate or just a businessman. Believe it or not, you, and they, will be able to do just that after listening to the best radio drama program I have ever heard. A warning to parents though: you will almost certainly need to convince your younger children that there really weren’t radio reporters on hand when Columbus landed in the New World, with Alexander the Great at the Battle for Asia, at the storming of the Bastille, or at the Battle of Gettysburg. The dramatizations are that good! Jim Hodges compiled the stories into 2 categories. The first, he called "You Were There - World History Collection," and the second is "You Were There - U.S. History Collection." Each CD (remember they are in the MP3 format!) contains about 30 stories, and each story is half an hour long. That’s 30 half-hour shows! The sampler is just that - samples. We want to give you fair warning about number 4. Socrates takes his own life in this episode, and it is presented as a somewhat noble act. Jim Hodges says, "It was a tough decision for me, but I decided to keep it in. I used it as a conversation starter with my family on the subject, and you might want to preview this one just to be sure." That’s another 14 and a half hours of listening time! Between the two CDs, there are 60 half-hour shows (OK, 1 of them is a repeat!) totaling 30 hours of educational, entertaining and just plain fun dramatizations spanning world and United States history. Order one or both MP3 CDs today. These are computer CD’s. The audio files will play on your computer CD drive, a DVD player (even the portable ones you take in the car with you! ), a laptop computer CD drive, or on an MP3 compatible CD player (available in almost any department store, including Wal-Mart). They will not play on a standard CD player. Pack your bag full of beef jerky and trail mix, grab your compass, and head off with William and Meriwether to explore and chart the American West! You will almost certainly need to convince your younger children that there really weren’t radio reporters on hand when Columbus landed in the New World, with Alexander the Great at the Battle for Asia, at the storming of the Bastille, or at the Battle of Gettysburg. 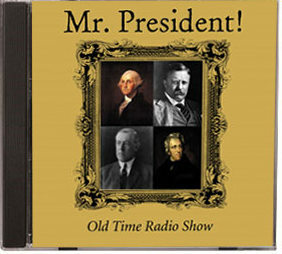 Now you can meet the U.S. Presidents as if they were living and speaking on the radio today. This is our newest in the series. You Are There is based on authentic historical fact and quotations. And now, on to our story....." So begin the incredibly well done Old Time Radio programs "You Are There!" originally broadcast between 1947 and 1950. And you really do feel like You Are There, the announcers report "live" from the scene of the action. 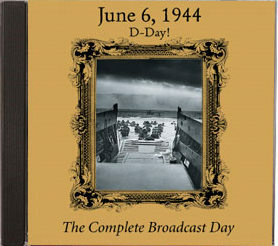 You and your family will feel what every American was feeling on D-Day by listening to these complete broadcast day MP3 CD recordings. Radio was the communication medium of the day and families gathered around them for all the latest news, information, and entertainment. 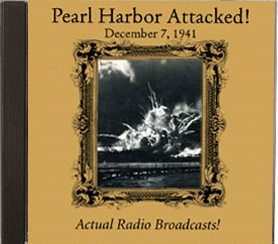 You and your family will feel what every American was feeling on Pearl Harbor Sunday by listening to these complete broadcast day MP3 CD recordings. 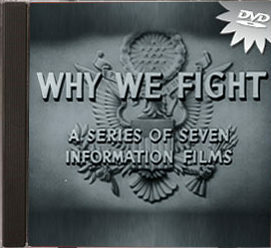 "Why We Fight" is a eight part propaganda ~ documentary series that chronicles the Second World War from its beginning, when Japan invaded China in 1931, to the Nazi's march across Europe, to the Japanese attack on Pearl Harbor, and America's entry into the war. When viewed in its entirety, you too will know why we fought!